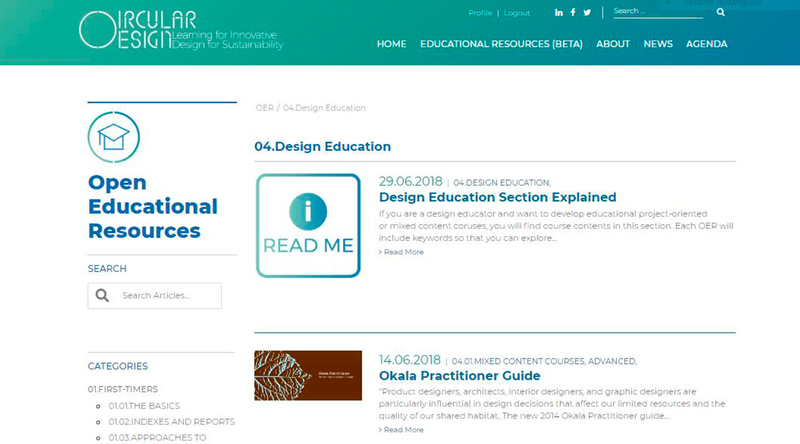 As part of the Circular Design – Learning for Innovative Design for Sustainability project funded by the Erasmus+ Programme of the European Union, a searchable database for Online Educational Resources (OERs) is released as a Beta version. The purpose of this database is to make online resources accessible to design students, practitioners, businesses, and educators aspiring to learn more about how the concerns of sustainability can be responded in their design practice. The database will help the educators to find and use the most appropriate tools fitting the educational needs of them and their students. We hope the database can convey insights and possible directions for developing educational resources through highlighting the gaps and shortcomings of available ones and inspire further studies on Learning for Innovative Design for Sustainability. We are continuously working to make the database more comprehensive and accessible to everyone. We expect your contribution and support for this database. If you have further questions, comments or suggestions, please contact the database admin (Yekta Bakırlıoğlu, University of Limerick) via e-mail: yekta.bakirlioglu@ul.ie or use our contact form.